The Research Report on "Global Foodservice Market" Plays Important Role in Emerging Economies and Seeing Significant Growth in World Food Industry. The report entitled “ Global Foodservice Market: Size, Trends & Forecasts (2019-2023)” provides a detailed analysis of the global foodservice market with analysis of market by value, growth and segments. The report also includes analysis of the food service market by value at the regional level encompassing Asia Pacific, Europe and Latin America regions. Under competitive landscape, players in North America food service market have been compared on the basis of the revenues generated. Moreover, the report assesses the key opportunities in the market and outlines the factors that are and will be driving the growth of the industry. Growth of the overall food service market has also been forecasted for the years 2019-2023, taking into consideration the previous growth patterns, the growth drivers and the current and future trends. Aramark, Compass Group and Sodexo Group are some of the key players operating in the global food service market whose company profiling is done in the report. In this segment of the report, business overview, financial overview and the business strategies of the companies are provided. Food service covers foods and beverages that are consumed outside of home. 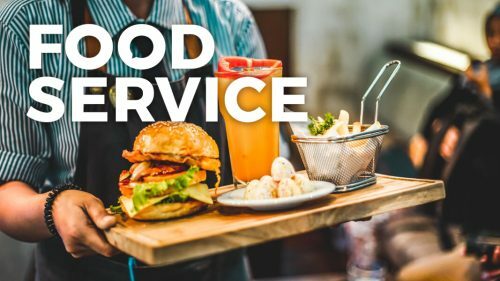 Food services are provided by various institutions/ companies that vary from commercial providers such as hotels and restaurants to the non commercial ones such as hospitals, colleges, universities etc. These services are of two types namely contract catering and the self operated ones. The global food service market has been split on the basis of three parameters namely outlet type, system type and end user. On the basis of outlet type, the market is sub segmented into full service restaurants, quick service restaurants, café and bars and fast casual restaurants. On the basis of system type, the market has been split into conventional, centralized, ready made and assembly service systems. On the basis of end users, the market has been sub divided into commercial and non commercial. The global food service market is forecasted to grow at a healthy rate during the projected period (2019-2023). The market is supported by various growth drivers such as growing spending on food away from home (FAFH), inflation in demand for outsourcing services, spike in number of business and industries (B&I), surging global gross national income and expanding middle class population. The market also faces challenges such as catering to client expectations, increasing food safety issues and stringent regulatory laws. Customization in food menu, fueling demand for healthy food, growing number of mergers and acquisitions (M&A), high demand for gluten free food and emergence of online food ordering platforms are some of the latest trends existing in the market.